This time Thor teams up with the long absent Bruce Banner, Loki and Valkyrie to take down the evil goddess of death, Hela. There’s also this prophecy about Ragnarok destroying Asgard that they keep mentioning throughout the movie to remind you why it’s called Thor: Ragnarok. Taika Waititi directs and stars alongside the respective reprisals of Chris Hemsworth and Tom Hiddleston. The film also stars Tessa Thompson as the stand-out, Valkyrie, with Cate Blanchett as Hela, Karl Urban as Skurge and the ever-so-charming Jeff Goldblum as Jeff Goldblum (I mean the Grandmaster). Ragnarok has now unleashed itself into theaters and the critics and fans are raving. People are calling it the best Marvel movie yet. My thoughts are that it’s the best OK movie you can see right now. 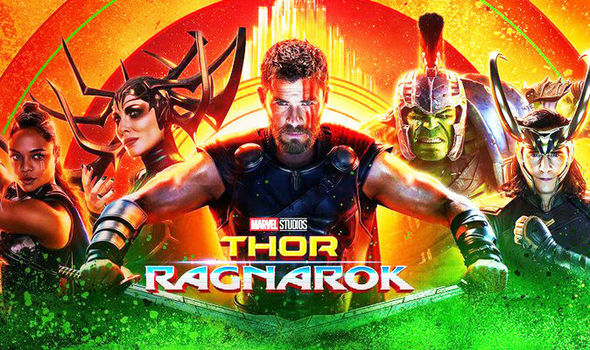 To put it shortly, “Thor: Ragnarok” is not good, not bad, just…fine. The film essentially just takes what worked in other Marvel movies such as “Guardians of the Galaxy” and the first two Thor installments and crammed it into one movie. The reason this doesn’t work that well is that style of humor in Guardians worked because it was written for those characters. Now it’s deployed into Thor’s movie and we get a lot of character breaking moments that ultimately weigh the film down or feel out of place. The film has some good laughs here and there, but every time I thought it was going somewhere interesting it quickly delved away from it, especially with its villain. Cate Blanchett does her best to finally give us another good Marvel villain but she isn’t given enough; there’s a lot of interesting layers to peel with her and Thor but they are quickly ignored. The story follows this same pattern. It’s the same Marvel formula of good versus evil, and the title villain shows up towards the end. This is not a bad thing, per se, it just doesn’t bring anything new to the table. There are a lot of moments where we could question things about our heroes and have some internal conflict but instead we get character-breaking jokes. There are a few emotional moments in the film that ultimately fall flat either due to the lack of build-up, or jokes that downplay them. Some of the jokes feel all too familiar or forced and don’t land. I know a lot of Marvel movies have humor in them but those films’ humor were in line with their characters. The film really needed to have some confidence and take itself more seriously. It felt like a very safe movie for the studio; I didn’t feel anything as I watched this film, just moderately entertained. The stuff that entertained me was good for the most part. The action scenes were fun and exciting and Jeff Goldblum brings a terrific comedic performance as the Grandmaster. He brought the level of comedy that the film needed because it’s clearly established and level with his character. Every time we left his garbage planet and went back to Hela and the main plot, I just wanted to go back. The main story is uninteresting and the only character with a complete arc is Karl Urban, who is somehow still wasted like he always is. Everyone else’s arcs are introduced then never given enough time in the third act, nor in its intense yet underwhelming resolution. Tessa Thompson does give this film a little more resonance and some of the better moments. The movie is never bad, it’s just extremely average. In the end, “Thor: Ragnarok” is the best Marvel movie because it’s just another Marvel movie. None of them are anything spectacular; granted, some stand out more than others, but even so. Marvel has given us tons to explore, but they have to run out of steam at some point. There’s only so much you can do with the same good formula. This time they played it safe and gave us another movie to sit back, relax, and kill two hours while being worth the price of admission at the same time. Despite my criticisms I’d still recommend it as a fun movie to watch with friends. There’s not a whole lot wrong with the Marvel formula, they just don’t take risks every time.